We’ve been enjoying some water play this week, as requested by the children. 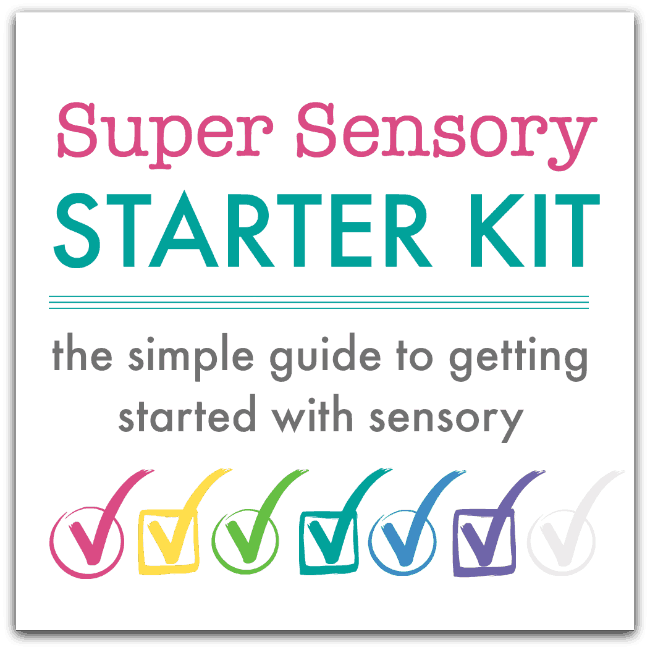 They love the sensory play element and I love that it’s the cleanest messy play activity around! 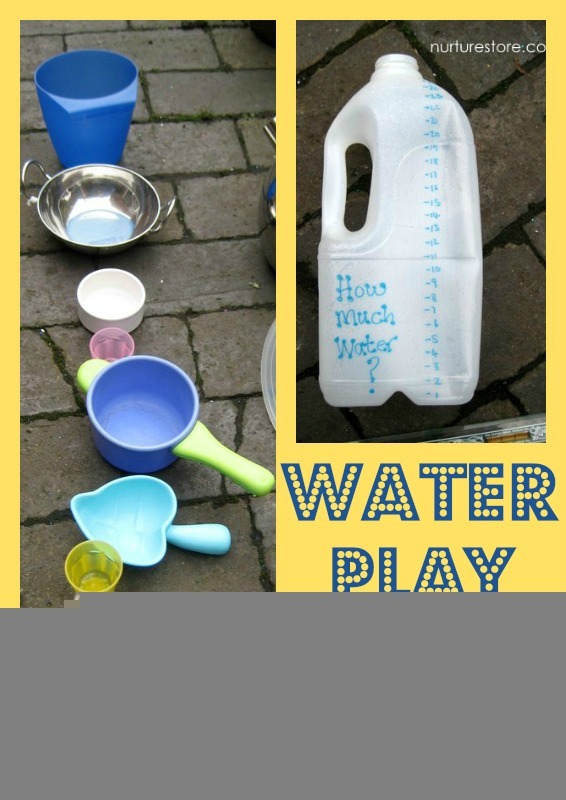 The addition of a few extra materials, and some question prompts from me, turned their water play into some science experiments and maths play. 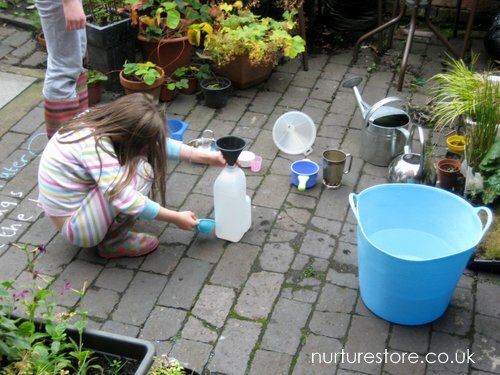 L asked to play with water because she said she needed to know if big cups had more drink in them. I’m not sure where her question came from, but I was of course really happy to help her set up an experiment so she could work it out. 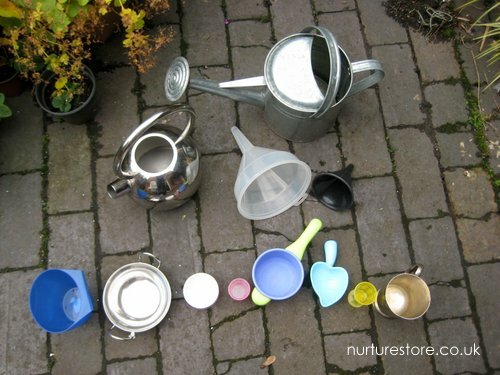 We found a variety of cups, pots and pans around the house, giving her an interesting mix of objects to try out. 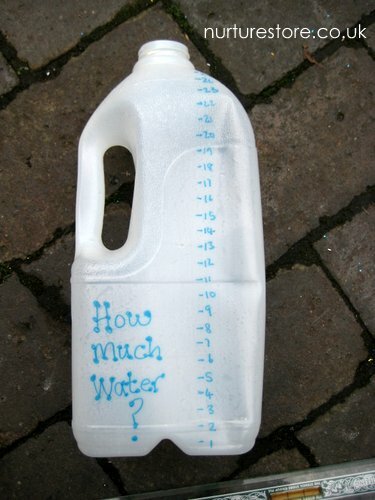 I added in some extra maths play by quickly turning a milk carton into a water gauge. I just used a ruler and permanent marker to draw a scale up one side, and added in some numbers so she could compare her results. You could use a real measuring jug, with an accurate scale of litres and pints, but we wanted something simple and quick that added in some maths but let us get playing straight away. 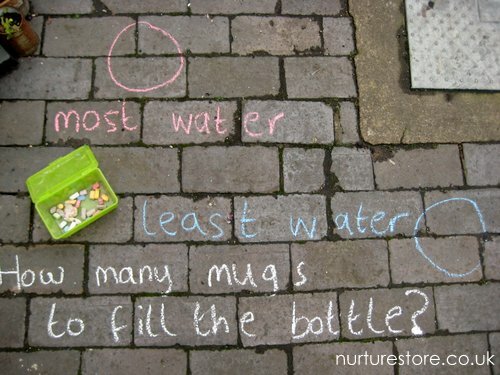 I love using chalk in the garden to extend the children’s play, and a few questions turned their water play into some detailed experiments. I asked them to guess what the answers would be before they measured, and to estimate some of the results. They then were off, enjoying their water play, but with lots of maths and science questions added into the fun. And L got to work out for herself the answer to her original question. Previous article: Top 10 Pinterest boards for homeschoolNext article: Thanksgiving weekend special offer: Learning Through Play! I love your use of chalk for sorting and posing questions.